Watch the streaming video of the lecture and slideshow (720p MOV file, 1.2GB, 41 minutes). 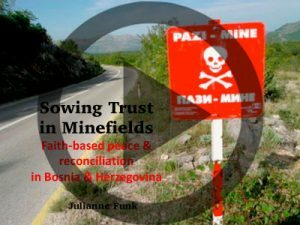 Alternative religious responses to ethnic conflict in Bosnia-Herzegovina: Faith-based peace and reconciliation Religion is often accused of intolerance towards other religions and, consequently, religious diversity in a society is assumed to be a cause for crisis, instability, and even armed violence. Yet religious faith also serves as a basis of shared values and a motivator for reconciliation and mutual understanding for many believers. Using examples from post-war Bosnia and Herzegovina, Julianne Funk (University of Zurich), will explore this dynamic according to her qualitative empirical research and a set of faith-based peace-building methods. Given current public opinion about Islam, this research is notable in its emphasis on Muslim peacemakers in Bosnia and Herzegovina. Julianne Funk is a peace scholar-practitioner specializing on Bosnia and Herzegovina. She divides her time between teaching at the University of Zurich (in political science and religious studies) and working for local NGOs in the former Yugoslavia. Currently she is coordinating the project “Trauma, Memory and Healing in the Balkans and Beyond” for TPO Foundation in Sarajevo. Julianne received her PhD and MA (social sciences, peace and con?ict studies) from the Katholieke Universiteit Leuven, Belgium, and her BA (theology) from Wheaton College in the US. Her recent research and publications include the themes of lived religion, Bosnian Islam, suživot (coexistence), trauma and healing. NOTE: You can also listen to Dr. Funk’s lecture as a podcast (audio-only) using the MP3 audio embedded below.